Breathing in fire, smoke, and chemical additives is certainly different from sitting down. 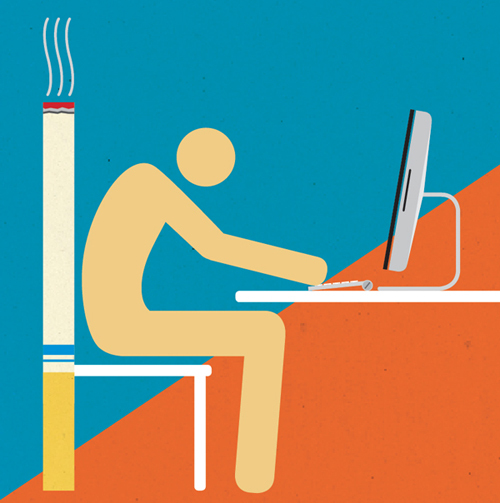 Sitting is the new smoking is a term that has caught on recently, with the good intention of attempting to curb the obesity epidemic. It has come to the surface that excessive sitting whether for work or to binge watch television shows is like pouring gasoline on the fire that is the chances of getting cancer in America. There are many good groups, charities, drives, purposes, and quests to try to stand up to cancer. Equating sitting down to smoking a cigarette is not one of them. More exercise is good. Clean eating is good. Regular medical check ups are good. Preventive medicine is good. Telling people sitting down too much will kill them, is bad. Using fear as a tool for a good cause is nothing more than a pipe dream, it is an oxymoron. Fear is a tool for bad, and evil. A good cause, in the end cannot benefit from using fear as a tool. Scaring people to exercise? Most people are already scared to exercise. Are we counting on a double negative? The threat of diabetes and aesthetic exile aren’t already enough, we’re going to go the; being fat will give you cancer route? I am a person who exercises regularly. I am a person who believes in physical fitness, clean eating, mental sharpening, and emotional well-being. I have also been a fast food eating, knowledge hating, couch potato. People who live a life, in which their hopes and dreams, of the life they want to live, are vastly beyond out of reach; seek solace in the relaxation and escapism that a comfortable seat and a high-definition screen to stare at, provides them. The physical activity is just more work; is a paradigm of work being associated with pain. What are we as a society doing to make people associate physical activity with pleasure? Besides fat shaming and feeding into the narcissism of the physically fit in the name of inspiration. Epidemic is not a term to be used or confused lightly. An epidemic is not solved by telling people to drink more water and/or take more vitamins. The obesity epidemic in America is as much a psychological one as it is a physical one. Until we as a society, culture, and race are willing to address the tough, deep, and complicated questions about why people are willing to cause massive suffering to their bodies in the name of temporary pleasure for the mind and spirit; then anything and everything done to curb such behaviors and habits are nothing more than lip service. The only thing worse than lip service is fear mongering, which is exactly what the sitting is the new smoking movement is; even if it is a road paved with good intentions. What Does it Mean when #Apple Has More $$$ Than the US Govt?